Here is a picture of the two members of the opposition who were arrested today, October 26, 2014, during an anti-Government protest. 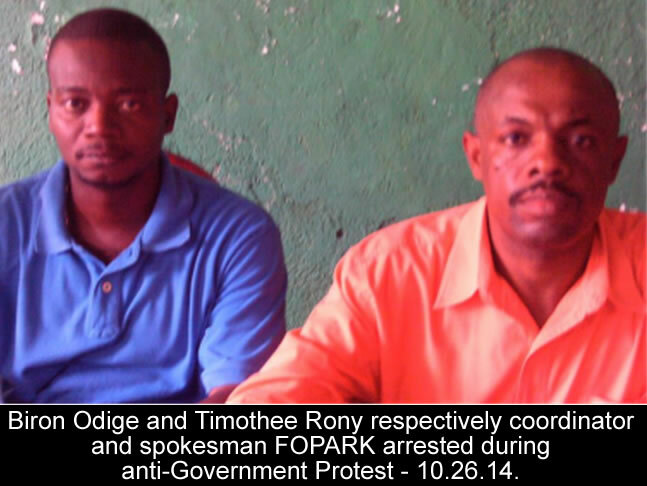 Coordinator Biron Odige and spokesman for FOPARK(Mobilizasyon manch long pou voye Mateli ale) and Rony Timothee were both arrested. The two were arrested at the opposition rally in Bel Air, at the Church of Our Lady of Perpetual Help in the morning and taken to the police station in Petion-ville. The National Police has not provided any information concerning the arrest. The protest did go on as scheduled, however. Several thousand protesters marched through the capital demanding the chance to vote in legislative and local elections. They started their rally in Bel Air slum, burning piles of wood and holding up their voting cards to show they were ready to cast ballots. They traveled the streets of the Capital chanting several anti-Martelly slogans. the crowd got bigger as they reached St Martin, Delmas and Petion-ville to end at the Champ de Mars. Mezanmi, sanble Rony Timothee nan cho anko oui ak La Polic. Nan Manifestasyon ke mesye FOPARK tap organize-a, La Polic vini li pran ni Rony Timothee avek Biron Odige, yon lot mam nan organizasyon-a, yo mete neg yo anba kod oui.